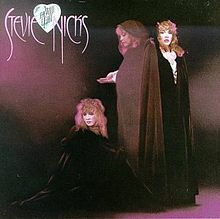 When I first heard the first single, “Stand Back,” to Stevie Nicks’s 1983 album, “The Wild Heart,” I have to admit that I was rather blown away. There was an energy behind this song that I can’t explain, especially as it’s not done with hard guitar power chords. Her voice matches this song very well and please, no comments about Stevie sounding like a sheep. Needless to say, “Stand Back” is my all time favourite Stevie Nicks song but I often wonder how it would sound if it guitars dominated the supporting music as opposed to keyboards and of course a cranking guitar solo. Keyboards is the theme of “The Wild Heart” album since it was the oncoming trend of the decade. However, having the quality musicians who play on the album, the keyboards are done intelligently. Then again, all of the songs have the same quality musicianship in each of them. The title track opens things very well and sets the tone for the rest of the album. This is quickly followed by the second single from the album, “If Anyone Falls.” Not a bad song, very over done with the keyboards but it doesn’t hold a candle to “Stand Back.” “Gate and Garden” is more of a ballad but there is a guitar solo on it and that saves the song. An interesting note is the track, “Enchanted.” This song is reminiscent of the song “Dreams” from the classic Fleetwood Mac “Rumours” album. After my favourite song, Stevie once again teams up with Tom Petty like she did on her previous album, “Belladonna.” Written by Petty, “I Will Run to You” opens with a promising guitar riff but for me, it doesn’t quite have the magic they produced on “Stop Dragging My Heart Around” but it does have a few catchy hooks, so it’s not a bad song. The rockiest song here is “Nothing Ever Changes.” The only song where I can hear guitar over the keyboards. Then again, Don Felder does play guitar on the track and is allowed to play a small solo but it is the saxophone that stands out the most for this track. “Nothing Ever Changes” is the climax to the album because the final two songs don’t really do anything for me. There were many session musicians on the album as well but the list would be extremely long. 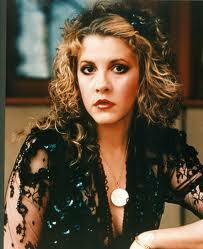 In 1983, Stevie Nicks was probably the most successful of the members of Fleetwood Mac on solo projects, probably the most successful of all time. What was best about her voice was that it could stretch to sing a range of music. While she shows this with “The Wild Heart” album, I often wonder what she would sound like with a metal band.